13Bit Productions is excited to present the first in our series of interviews with low budget legends. Here, we speak with Lloyd Kaufman, the head of Troma Films and the Director of such low budget legends as “Toxic Avenger,” “Class of Nuk’em High” and “Poultrygeist.” Lloyd has been making classic films for over forty years, and is heavily involved in promoting and protecting the rights of independent filmmakers. We went out to Troma HQ in Queens last fall and are proud to kick off our series with Lloyd. Here is the first of three-part chat with him. How did you get involved in filmmaking? And was that what you always wanted to do? I got involved in filmmaking by making a huge mistake. I went to Yale University. And it was the ’60s. I was going to be, like, a social worker or teacher and make the world a better place, teach people with hooks for hands how to finger paint, teach bums how to paint happy faces on beads and string the beads together. But, they put me in a room with a movie nut. My roommate freshman year at Yale was a movie nut. He ran the Yale Film Society. And I started wandering into the — to the auditorium and watched all these movies they started showing. And I wasn’t interested in movies as a kid. I was more into the legitimate theater. Being a gay married man, I’ve wept through many Barbara Streisand shows and Judy Garland and all that stuff and pulleys and curtains and animals and all that. But I didn’t know Charlie Chaplin was a film director. I never even heard the word “director”. I didn’t what a film director meant. I never heard of John Ford, Howard Hawks, Jean Renoir, Stan Brakhage, Andy Warhol. I knew who Andy Warhol was. I didn’t know he directed movies. I didn’t know any of that. I had no idea. And I suddenly just kept getting blown away. I’d keep watching these films and– and there at the Yale Film Society. And one day I was in the auditorium of the Yale Film Society. About three other people were in there watching To Be or Not To Be, directed by Ernst Lubitsch. And it so knocked me out that I decided right then and there in the darkness of the Yale auditorium that I would give what I have to the film-going public. So if you want to, you know, get revenge for Troma, if you want to blame somebody for Troma, go to the graves of Ernst Lubitsch, Jack Benny, Carole Lombard, Robert Stack, the team that brought you To Be or Not To Be and urinate on their graves. Then what? What, it’s not enough? Well, I got– I got brainwashed by the Cahiers du Cinema, which in French means, “Lloyd Kaufman is the greatest filmmaker in the whole world.” But it also is a magazine that the French cinematheque puts out. And I started reading it. And I bought into the auteur theory of filmmaking. And I speak fluent French, so I could read those things in French. And there were articles by Chabreau and Truffaut and blah blah. And they– in those days they were journalists. And they became filmmakers more in the ’60s. But they were journalists. So they propounded the auteur theory, the filmmaker should be total control of his art. It should be an expression of his soul so that the way not to compromise was to stay in New York. And unfortunately, I bought into the– to the being an auteur filmmaker. And now I’m living in a refrigerator box over on West 92nd Street. So, wait, what does that mean? What are the nuts and bolts of being an auteur? Well, the idea of being an auteur is to have total freedom and to control every aspect of the film. And, indeed, that’s what I’ve done for– I’ve been lucky enough to do that for 40 years on celluloid. And of course my name, Lloyd, is the third syllable. So I bought a Bolex, in my sophomore year at Yale. I bought a Bolex. A Bolex is not a social disease. It’s not venereal disease. it is a Swiss-made wind-up 16 millimeter camera. You cannot shoot sync sound with it. So it was a very good discipline because it taught me to concentrate– I had to concentrate on the visual. So I was basically making silent movies with a narration track with sound effects and music. So it basically was a silent film. And I decided I would make feature-length movies even though most of my contemporaries were making acid-driven psychedelic short films, I preferred the narrative long form. And to this day I’ve stayed pretty much in that area. How much did it cost, roughly? The first movie I made, the first feature-length movie I made was called The Girl Who Returned. It was 16 millimeter, black and white, filmed with my Bolex, obviously. I filmed it at Stanford University and Yale. In fact, Michael Herz, my partner of over 30 years is in it and his beautiful wife, Maris. We are still working together in spite of The Girl Who Returned. And Norman Mailer’s daughter was in it, Susan. And then everybody else was basically just students at Stanford or Yale. And I think the total– the total cost was about $3,000 for a feature-length movie, which in those days was considered miraculous. But, of course, today, with the modern technology, you can make a feature-length movie for nothing. And we’ve done it here. We’ve done All the Love You Cannes, which is a feature-length documentary about my experiences at the Cannes Film Festival over the years 1999 through 2001. And we’ve done a series– we just did a film called Poultry in Motion, Truth is Stranger than Chicken, which is the documentary about the making of Poultrygeist: Night of the Chicken Dead, a 35– that’s a 35 millimeter movie which came out in 2008 and I believe played at the Avignon Film Festival. Its budget was about half a million. We saw the doc at N.Y.U.– last winter. Oh, that’s right, you guys. Yeah, yeah, yeah, you guys were there. You didn’t stay for the whole thing, though. You kind of– you couldn’t stay for the whole thing, that’s right. You were too busy being involved with Mr. Lumiere, Lu– what’s his name? Lumiere? Oh, yeah, yes, Thomas Wilfred. We had to go piss on his grave. Yeah, what’s that guy’s name again? Wait a minute, what was the movie I saw? Wasn’t it Lumiere? Tell me about it, tell– (EXHALES) tell me about it. We don’t take it personally. We like it. Well, it’s not that people haven’t caught up with your movie. It’s that, again, we are– our world is controlled by– a– a very elite group of giant devil-worshipping international media conglomerates. And they– they control the marketplace. And if you were– if you commit the sin of being an independent artist, you are economically blacklisted. It doesn’t matter whether you– you guys could make Gone With the Wind and it would– you could make Star Wars and it would be blacklisted. Doesn’t matter. Block– Blockbuster never– never had one Troma movie on their shelves in the history of 40 years of my filmmaking. The Toxic Avenger, Cannibal! the Musical, which is Trey Parker and Matt Stone, the South Park guys, never been in a Blockbuster, never been on television. How about the I.F.T.A.? Do you want to tell us about that, how you’ve been involved with that? Well, throughout my years of making movies, I’ve written books. I’ve written essays, Lloyd’s Roids at Troma.com. And I’ve tried, as has Michael Herz, we have tried once we got Troma sort of established, we tried to do what we could to promote the cause of independent art and independent commerce. And recently I ran for Chairman of the Independent Film and Television Alliance so that I could perhaps use the treasury of this trade association to do what we can to try to educate the legislate– Legislature and the Federal Communications Committee in Washington, D.C. that independent art and commerce is under assault, that due to the cartel of these giant conglomerates, it’s– it’s under assault. Ah, and here is 25 cents if– here, young boy– oh, thank you so much. Thank you, young man. Question is what kind of animal is Scott? Oh, I.F.T.A., well, so the Independent Film and Television Alliance is a trade association of about 150 members. It’s basically the heart and soul of the independent film community. And it includes Troma. It includes Roger Corman’s company. It includes Mark Damon, who produced the Oscar-winning movie, Monster, the people that made Crash are members. The people who financed Lord of the Rings are members. And the idea is that our 140 companies are being strangled by the cartel, the oligopoly of these giant media conglomerates who have been able to go down to Washington to get the laws and rules changed so that the playing field, which used to be almost level– it was always against us. But it was kind of like this. And now the playing field of the marketplace for independent content as they call it is literally like a stripper’s greased stripper’s pole. You just can’t– it’s just impossible. So I ran for Chairman of I.F.T.A. with the– on the platform that we need to– we need to use some of our treasury to lobby in Washington against media consolidation, to educate the Congress and the committee, the Legislative Committees, that this oligopoly is hurting independent art. And many, many jobs are being lost because the independent art community, aside from being the engine of employment, it’s also the leader of ingenuity. It creates most of the Oscar-winning movies. And it is a disaster if the independent entertainment arena is made into a tiny little circle instead of a giant three-dimensional sphere. So we are down there in Washington lobbying. We are also working the preserve net neutrality on the internet, because the internet is the last democratic medium. And the big– the big telephone companies and the M.P.A.A., which is the trade association for the big conglomerates like Viacom, Paramount, G.E., which owns N.B.C. and Universal Studios, they– etcetera, Rupert Murdoch, who owns everything. And they are down in Washington 24/7 trying to get net neutrality done away with. They don’t want net neutrality. They do not want freedom on the internet. They don’t want diversity on the internet. And luckily we have President Barack O., who has spoken out in favor of diversity on the internet. And we are hoping that he might hear us. Well, in order to be a member of the Independent Film and Television Alliance, you can go to I.F.T.A., hyphen, online, dot org and read the requirements. They– you have to have distributed a certain number of movies or sold a certain number of movies. Most of our members are sales agents. And– but basically we have a big tent. So we have people who have a couple of employees who are middle men who are selling American films to– to far-away lands, or in some cases selling far away land– far away movies to American clients. And we have huge companies, Focus Films, which is a division of G.E., they are members because they finance their movies independently. Miramax, which is a division of Disney is a member of the Independent Film and Television Alliance because they fit– they– they finance their movies from independent sources. They don’t take the financing directly from the conglomerate. But most of our members are smaller and I would say very, very different from each other. It’s a very diverse group. So you don’t see G.E. and Miramax being a fifth column? I don’t think that– well, G.E. is not– if anything, they want to crush I.F.T.A. They want– well– I don’t even think they know we’re around, to be honest. Well that– what about distribution for indies and low-budget films? We– we wanted to ask you about that self-distribution? Do you think that’s viable? Do you think everything’s going to go, like, online, YouTube? Also, do you think film festivals are still relevant? The reason that Troma exists for 35 years, and I think in the history of cinema there has never been an independent movie company or movie studio that has existed for 35 years. I don’t think it– I think we have the Babe Ruth of independent studios. And certainly– certainly if– we are the only independent movie studio that has existed for 35 years and have never had a hit. 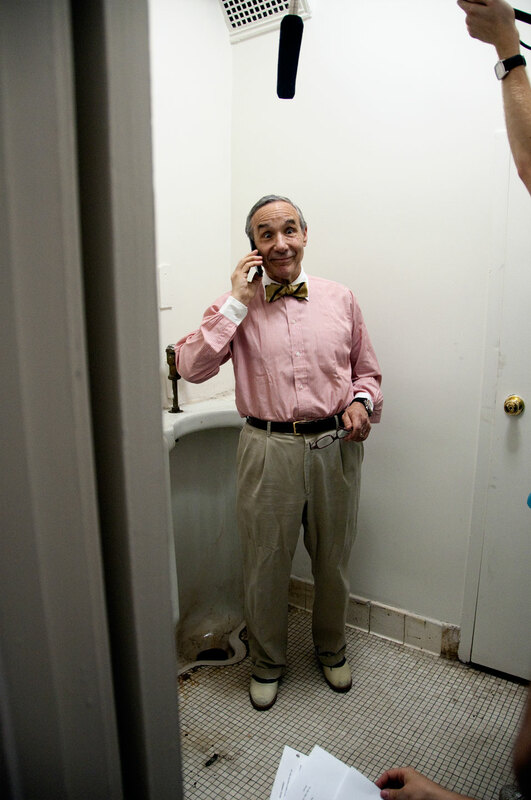 And as long as I, Lloyd Kaufman, am President of Troma Entertainment, we will continue this unblemished record. But, I think the reason we’re still around is that we– early in the game, in the mid-se– in the early ’70s, after having been screwed a few times, we decided we would learn the distribution game and distribute our own damn movies. And my next book, my next book after Produce Your Own Damn Movie, which comes out in August, my next book is going to be called Distribute Your Own Damn Movie or Sell Your Own Damn Movie. And I will try to reveal some of the methodology that we have perfected over the years of getting a high profile and a big bang for no bucks. We spend very little. When Poultrygeist was distributed in the United States, I think we spent less than 20– $250,000 on over 300 different cinemas. It played around 300 cinemas around the country, not all at the same time, of course, one by one for the most part. But, we spent about $250,000 whereas a typical mainstream movie that comes out spends $40 million to $100 million.